The man suspected in the killing of two television journalists as they were conducting a live television interview in Virginia on Wednesday morning shot and killed himself, according to authorities. The suspect, identified as Vester L. Flanagan, 41, of Roanoke, died at approximately 1:30 p.m. after succumbing to self-inflicted gunshot wound, police said in an afternoon press conference. The station, WDBJ7 in Roanoke, Virginia, reported that Flanagan shot himself as Virginia State Police were closing in on his rental car on Interstate 66 in Fauquier County. He was driving a rental car after leaving his own car at the Roanoke–Blacksburg Regional Airport this morning, the station said. "Minutes later, the suspect's vehicle ran off the road and crashed. The troopers approached the vehicle and found the male driver suffering from a gunshot wound," police said in the statement. The on-air shooting of the journalists occurred at about 6:45 a.m. during a live broadcast. The incident took place in Bedford County, in the south-central part of the state and about 120 miles from the capital of Richmond. 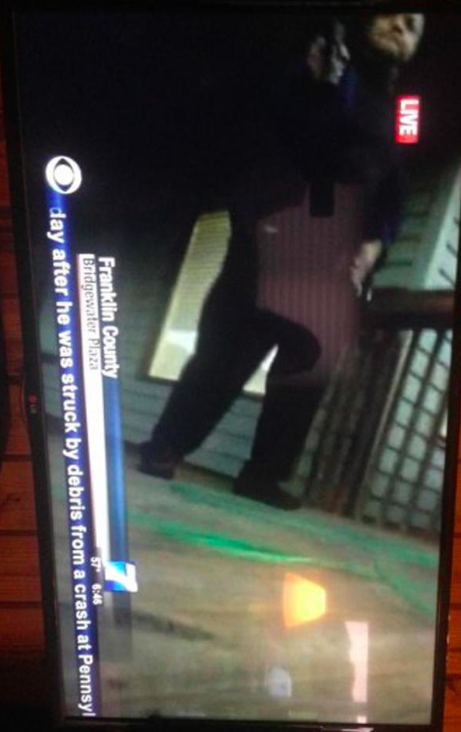 WDBJ7 said the reporter, Alison Parker, 24, and the cameraman, Adam Ward, 27, died in the incident. The woman being interviewed, Vicki Gardner, executive director of the Smith Mountain Lake Regional Chamber of Commerce, was shot in the back and was in stable condition following surgery, officials said. The station reported that Flanagan was a former employee who was let go two years ago. 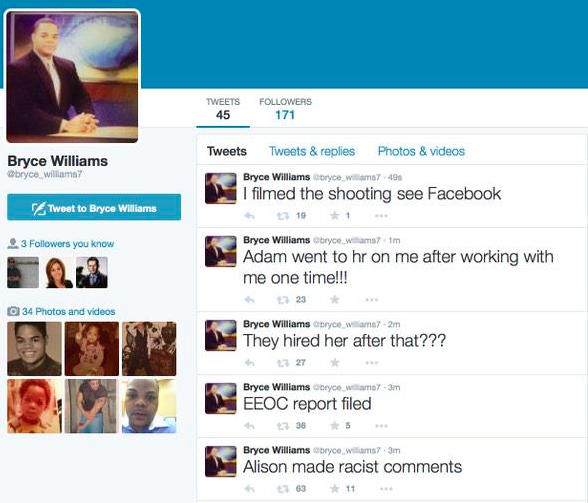 Flanagan used the name Bryce Williams when he worked at WDBJ7. Police were not able to immediately identify a motive, though evidence suggests that his departure from the station may have played into the shooting. "We are not sure of the motive. He was a prior employee, but we are looking into all of those dimensions," said Franklin County Sheriff Bill Overton. "It's obvious that this gentleman was disturbed in some way over the way things transpired in his life and things were spiraling out of control." 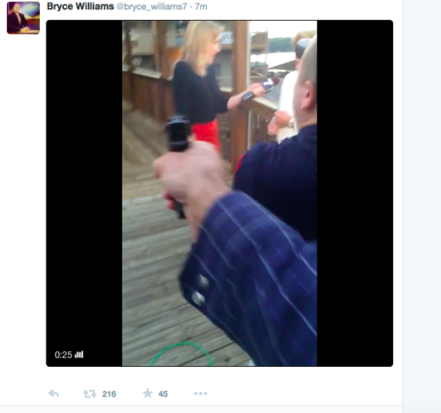 Twitter account @Bryce_Williams7 posted two videos clearly showing the shooting. The account has since been suspended. In the Twitter account, @Bryce_Williams7 made allegations against station personnel before the account was suspended. ABC News reports that the network received a 23-page fax from Flanagan, identifying himself as Bryce Williams, “sometime between last night and this morning,” that staffers have turned over to authorities. In the document, Flanagan references the Charleston church shooting on June 17 as a tipping point and also makes note of the Virginia Tech mass shooter Seung Hui Cho, claiming that Jehovah spoke to him "telling him to act." The document also made claims of suffering racial discrimination, bullying, and sexual harassment, and said that he was attacked for being black and gay. In 2000, Flanagan sued another station where he worked in Florida, alleging he had been called a "monkey" and discriminated against because he was black. The lawsuit, filed in federal court against Tallahassee station WTWC, said a supervisor at the station called black people lazy. The Florida case was settled and dismissed the next year, court records show. One of Flanagan's former employers fired him for "odd behavior," said San Diego 6 News Director Don Shafer, who noted that despite being a good "on-air performer" and a "pretty good reporter," things began to get strange with Flanagan. His erratic behavior surfaced again earlier this summer, CNN reports, in the form of a video that captured a road rage incident in July. In a radio interview, Virginia Gov. Terry McAuliffe called for more gun control. "There are certain people who should not be entitled to own a firearm," he said. "Everyone who purchases a firearm in the commonwealth of Virginia should go through a background check." Parker and Ward were filming a feature segment for the morning news program at Bridgewater Plaza, a shopping and recreation plaza. "I cannot tell you how much they were loved," WDBJ General Manager Jeff Marks said about Parker and Ward during a somber broadcast. Station employees could be heard crying in the background. "These two were more than what you saw here on TV, they were much, much more," anchor Kimberly McBroom said. Asked on CNN if the station had been targeted or had been threatened, Marks said, "Every now and then you get a crazy email or something and we'll look into it. Nothing of this nature that any of us could recall." "We don't make a secret of where we report from, we may start now," Marks said. Parker and Ward were engaged to be married to other people associated with the television station. Parker's fiance, Chris Hurst, is an anchor for WDBJ7. He expressed his grief on Twitter. The two had just celebrated Parker's birthday last week. I am comforted by everyone at @WDBJ7. We are a family. She worked with Adam every day. They were a team. I am heartbroken for his fiancee. Ward was reportedly engaged to WDBJ producer Melissa Ott, whose last day at the station was Wednesday. She had accepted a position at another station in Charlotte. He had planned to join her there and find a new job with her. Ott, a native of Gibbstown, New Jersey, and Penn State graduate, was a former intern at Philadelphia's NBC 10. She was celebrating her final day at the WDBJ-TV studio when the shooting occurred, NBC 10 reports. Ward is a graduate of Salem High School and Virginia Tech. His LinkedIn profile stated that he had been a photojournalist for WDBJ for four years. Parker, who grew up in Martinsville, Virginia, attended Patrick Henry Community College and James Madison University, the station said. Her fiancee, Chris Hurst, the evening news anchor at WDBJ17, attended Conestoga High School and was a former student at Temple University, according to Philly.com. According to Parker's LinkedIn page, she had been working at the TV station since May 2014. Previously, she was the bureau chief in Jacksonville, North Carolina. She graduated from James Madison University in 2012. Parker had recently completed a four-part series called "Childhood Lost" on child abuse. The station's broadcast showed Parker interviewing Vicki Gardner about Smith Mountain Lake and tourism development in the area. Gunshots erupted, and as Ward fell, his camera hit the ground but kept running. An image caught on camera showed what appeared to be a man in dark clothing facing the camera with a weapon in his right hand. Mayra Jone Barlow, who worked at the station before Parker and Ward started there, told PhillyVoice that employees of the station were always close-knit. "I am heartbroken for them, their loved ones and the entire WDBJ family," she said. "Channel 7 is truly a family and I can't imagine how they are continuing to do their jobs amidst this tragedy." White House spokesman Josh Earnest, reflecting frustration that President Barack Obama has expressed over his inability to push through laws to tighten gun laws, told reporters that Congress could pass legislation that would have a "tangible impact on reducing gun violence in this country." Virginia Governor Terry McAuliffe said, "Keeping guns out of the hands of people who would use them to harm our family, friends and loved ones is not a political issue; it is a matter of ensuring that more people can come home safely at the end of the day." A representative from local station 6ABC told PhillyVoice that the station was not planning on increasing security after the shooting. NBC10, CBSPhilly and Fox29 declined to immediately comment. Reuters and PhillyVoice staffers Sharon Lurye, Jennifer Reardon, Michael Tanenbaum, and Elisa Lala contributed to this report. Editor's Note: An earlier version of this story included a tweet of a photo that wrongly labeled the man in the picture as suspected shooter Vester L. Flanagan. PhillyVoice regrets the error.